A wrestling MMO, or why I should not become bored. Last post I made I went over my nostalgia for my old wrestling role-playing game group. Today I want to go over what brought that up. It all started with me getting bored. Apparently I should not be allowed to become bored. When I get bored I start planning things. Recently I went on a trip that we need to take my wife’s car because it has more cargo room than mine. I can’t drive a stick shift so she had to drive. It was a long drive. I ended up with a lot of time to think. And where did my mind go? I started mapping out how you would structure a functional wrestling MMO. Yeah, really, I went there of all places. So we went over my history with wrestling role-playing. Go back and re-read it if you need a refresher. The other link that leads to my boredom inspired plan was a trip to San Diego Comic Con one year. It was when Everquest was the king of the MMO heap. There was a panel that was about designing MMOs. At the panel I asked the panelist thought were the different genres that could translate to MMOs. The lead designer said that any genre that is successful as a regular video game would work as an MMO. You know what are fairly successful games? 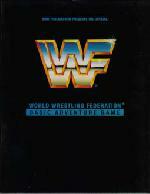 The WWE wrestling games, after all they put out one or more a year. So these are the elements that came together in my head on this long drive. So what plan did I come up with? Come with me on my whimsical flight of game design fantasy. The one major conceit needed to make the game work is that everything shown in professional wrestling is absolutely real. Also a wrestling game by its very nature is going to be Player vs. Player. There is the ability to have some Player vs. NPC action, but it would not be the focus of the design. Let’s start with the basics. How a character would work. Next you would select the look of your character. Not just what the avatar looks like, but how they stand and walk. 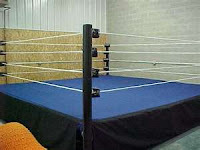 You would also select a ring entrance style. Alignment would be next, are you a face (hero) or heel (villain). Finally you would select personal information. Of course the character’s name would be the most important thing here. This would include a first and last name, plus an optional nickname. You would also need to pick which one people commonly call you. You would also select where you are from, and have text field to enter a character bio. Once your character is finished it would be off to the tutorial. The tutorial would take the form of going to a wrestling school. Here you would go through the basics of how the game works and a few sample matches. All matches in the tutorial would be player vs. NPC. Once you are done it is off to the big bad world of professional wrestling. The character will start off on the independent circuit. These are shows that have no real storyline outside of the match itself. All matches are set up by the game system itself. It would be possible to have matches some matches that are player vs. NPC here, but they would be worth less points then PvP. This brings us to rewards. Rewards would take two forms: points and money. Points would be spent on improving your stats, both in raising the overall stat, or buying a special maneuver if you meet the stat requirements for it. Money on the other hand would have several uses. You could by better gear to improve your look. You could upgrade to a flashier ring entrance. You could spend it to hire a manager or valet, which would be an NPC that would go to the ring with you and might provide some bonuses. You can also save it up for one time uses. Once your character is past the beginner levels they will have the opportunity to join a wrestling federation. This brings us to the thing you have to deal with if you want to have a wrestling game with thousands of players? In a wrestling game your goal would be to become the champion and hold that championship belt. But how do you do that? The answer is you base it on a guild structure, an in game organization of players. In most MMOs a guild is a large group that gets together to share resources and go on organized missions. In our proposed Wrestling MMO these would be called federations and would be the crux of the game. A federation would need 10 people to start. At first it would have a limit of 25 members. There would be a federation point system to allow for growth. Eventually the federation could grow to a membership max of 75. Each federation would start out with a championship belt. The members would compete amongst each other to be the champion. As the federation grows it can add more belts. As with the independent circuit, federation matches would be set up automatically by the system. Getting a title shot would be based on ranking in the federation. The rank would be calculated by various factors, such as overall win/loss record, how active you have been recently, if you had a recent title shot, and so forth. One rule that would have to be in place is that once you win a belt you have to defend it at least once a week. This way someone cannot just win the belt and sit on it. If you do not the system strips it from you and sets up a tournament to find a new champion. Beside a title match generates more money so there is a reason to get out there and defend it. The heads of the federation (which would be like officers in a regular MMO guild) could schedule periodic events, called PPV events (named for Pay-Per View events that real wrestling organizations have) They can be whenever they heads wanted them, but no more than once a week. There would be twenty slots available. Getting a slot would be based on how active you were in the week before the event and how well you did in your matches, as well as being logged into the game at the right time for slot selection. If a belt holder is logged in they automatically get a slot defending their belt. All PPV matches are worth double money. For additional interactions federations can have cross-promotional matches where two feds have a joint PPV with the winner being the fed that wins the most matches. And I’ll stop here. This is not everything I thought up, but it is the basics I came up with. Now in all fairness, I am not a game designer, and I do not know if what I came up with is feasible or not. I just know that I would love to play in a game like this. So what do you think? Cool idea or should I never be allowed to become bored again? Thank you for creating a character that we can look up to. My Favorite Role-playing game experience. Let’s get one thing straight, I love role-playing games. I’ve been a role-playing enthusiast since I was a teenager. I can trace my connection to the majority of my social circle to role-playing games. I spent several years working at a role-playing game company. I helped found an international organization devoted to role-playing. Role-playing is second to only comic books in the hierarchy of my fanboy interests. I’ve played several versions of Dungeons and Dragons. I’ve played most of the old World of Darkness games and a couple of the new. I’ve played Champions, Gamma World, Toon, Chill, Cyberpunk 2020, Deadlands, and many more. I am currently in a group that plays both Promethean and The Dresden Files RPG. However like every role-play there is that one game. Every role-player has one, that one group that just clicked for them and even years after it broke up still has that lingering nostalgia for it. In 1994 while working at Wizards of the Coast I found mine. I found it when I learned a co-worker found a copy of the WWF basic Adventure Game and had started a group and wanted to know if I was interested in joining. My favorite role-playing group of all time was a group playing an RPG based on Professional Wrestling. It was a game published by Whit publication. It was meant to be the main book for a whole line, but as far as I have ever been able to learn it was the only book released. To be honest that book as published was a so-so game but we worked at a gaming company. We were able to fix the rules to make a working game. And what a game it was. For the majority of the nearly two years we played this game there were only three of us playing. All players had several wrestlers and managers, a ref, and a ring announcer. It was structured so that in a match you would have two wrestlers and the third player would have his ref character in the match. Whoever was ref was the GM for that match. The game was basically a protracted fight that goes move by move with attacks and counters. In a night we would have time for about 4 to 5 matches and all three of got to play as all three of us also acted as gm. Our fictional wrestling organization was Intercontinental Wrestling Federation or the ICW. It was located in Las Vegas. Steve, whose house we played out went so far as to get little wrestling figures to use as miniatures and made a scale map of the arena that took up most of the table to use for play. As I said earlier each of us ran about 4 or 5 wrestlers. Mine were a mixed bag of various archetypes that would show up in wrestling. Johnny Hartman the all-American. He was a college football star from South Carolina that had gotten into wrestling as a form of cross-training. 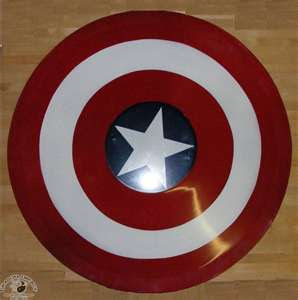 He was taken under the wing of “Captain America” Lance Arness, who he referred to as coach. He had a long rivalry with a wrestler only known as the Duke of Slamchester and a brief rivalry with the ICW champion the Golem. His finishing move was a pile driver he called the Touchdown. Vincent “The Don” Vincenzo was a Mafia themed wrestler. He was managed by Uncle Guido Vincenzo and teamed with his cousin Benny “the leg breaker” Pagliocci. I ran all three characters. Vincent would start most matches offering a bribe to his opponent to throw the match. His finishing move was a choke slam called the Strong arm. Jerry Aldini, who was often called the hardest working man in wrestling. He briefly held the Intercontinental champion ship after defeating Apollo Storm. Eventually had a heel turn after he felt he was disrespected once too often. We had storylines that would go on for months, we had rivalries, and we had pay-per-views. We were convinced that the house we played at was bugged because we would have a storyline and soon a similar storyline would appear in one of the real feds. Seriously, we had a game session where one wrestler was taken out with a high heel shoe. A week later on WCW Hulk Hogan was hit taken down with a high heel shoe. Of all the role-playing gaming groups I have been part of this one still stands as my favorite. I had more fun with this one than any other I have ever played in. It was that perfect mix of the right people together with the right game setting. We had three other players that joined briefly at various times, but it was usually the core three. The group finally broke up when Shawn, our third player lost interest and Steve and I didn’t think anyone could really take his place. I made a couple of attempts to put together new groups but they either didn’t gel or just didn’t get off the ground. And what made me bring up that bit of nostalgia? Stay tuned, I will be getting to that. So what was your favorite role-playing experience? Addressing the new Watchmen rumor. Watchman, more than any other title ever produced is the cornerstone of the modern comic book industry. (Yes, even more than The Dark Knight Returns.) Coming out in 1986 it redefined what could be done with the medium. So I have very mixed emotions about the rumors that DC is going to produce four prequel mini-series. Part of this is of course the knee jerk fanboy reaction. But beyond the lizard brain reaction is some real concerns. First off the original creators are not only not doing it; they really don’t want it to be done at all. It was a disagreement over the ownership of Watchmen that led Alan Moore to sever ties with DC comics. David Gibbons has gone on record as saying he would not like to see it happen as recently as this last summer. 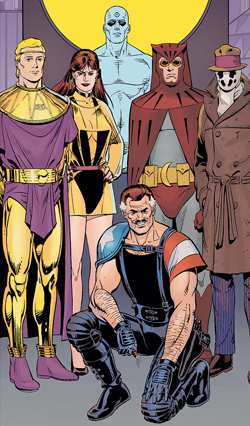 Now to be fair to DC Watchmen was created at a time when most work in the industry was work-for-hire and they own the characters. Add to that the fact that the characters are based directly on another set of characters DC owns and they are theirs to do with as they see fit. That being said as Marvel’s One More Day proved, just because you have the right to do something doesn’t mean it is a good idea. Watchmen was a nearly perfectly told story. It was paced to make each issue engaging but also make the whole story satisfying. The art was very much a part of the story with important elements being shown not told and often being in the background. It had a clear arc for the story and the individual characters. Even as beloved as it is, there really isn’t anything more that needs to be said. And this is what has me worried. Why are we revisiting Watchmen? It just smacks of a cash grab. I’m not saying a good story can’t come out of it. Last weekend my wife and I went to see “The Muppets.” Again this was a relaunch of an old franchise without the involvement of the original creators. However it is clear that the new creators understand the franchise and made it a labor of love. The result is a movie that is basically pure joy and made me laugh so hard I couldn’t breathe and later tear up just a bit. We can only hope that if DC does go ahead with a new Watchmen project that the new creative team has the same understand of that Property that Jason Segel had of the Muppets. Personally I think this is a bad idea and I would like them to just let the original stand. On the other hand it might end up eating those words if they do recapture the magic of the original. Or this might just be a rumor and we are getting worked up over nothing.